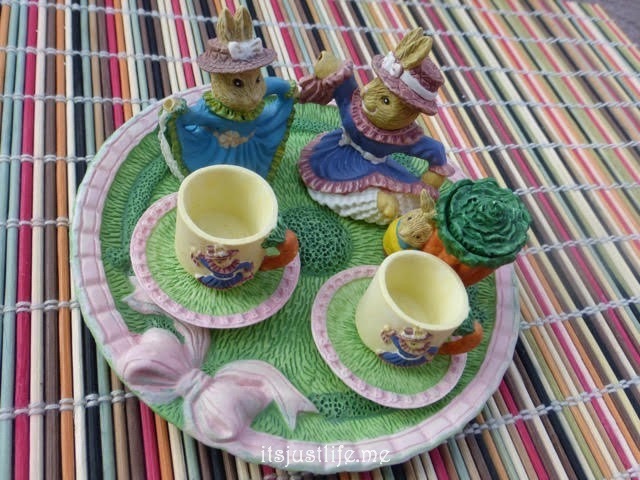 Today’s miniature tea set is one that is one I should give to my mom for her ever growing bunny collection. One time, a long time ago, she saw a bunny she liked and you know how that is. Once someone finds something they like it becomes a collection. I don’t think she really intended it to become a collection but thanks to family it has. The funny thing is that I am to blame for a lot of those bunnies multiplying in her house. Almost every time I visit I take a bunny (or two or three) and hide it somewhere. Sometimes it takes her months to find the elusive bunny and it always makes me giggle a bit when I get an email from her that says she found another one. Of course she is blaming my sister and myself for the box of bunnies in her basement that is growing with every visit and says it is going to be up to us to take care of those. Which we will when the time comes but for now it is fun. Every time you see a bunny think of my mom, will you? 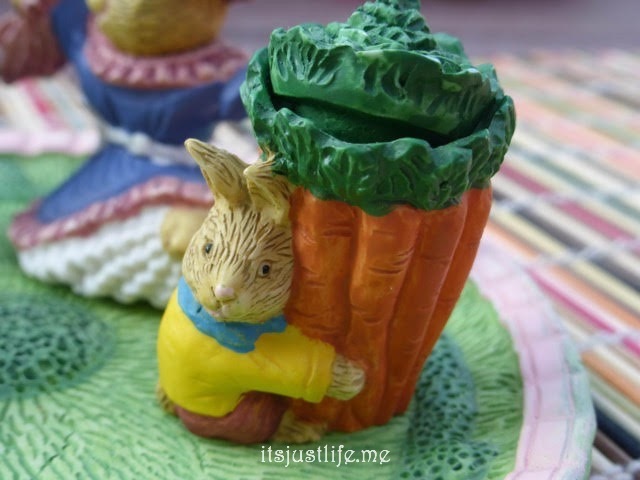 Even my hatred of cooked carrots loves this one – maybe because they aren’t cooked yet. What do you think? Should this one go live in Ohio for awhile with my mom? Collections happen like that. I tell people these days the only thing I collect is money. Must be very hard to find because people seldom send it to me. Oh well. Your mom may appreciate this story…. A friend redecorated her kitchen with a black and white theme. She bought a cow clock to hang on the wall. Soon after people started giving her cows out of the blue—you know, because they saw the clock and just knew she collected cows. She didn’t collect them but she soon had a collection of them. We non collectors feel your Mom’s pain. HOWEVER, we do enjoy other peoples collections. 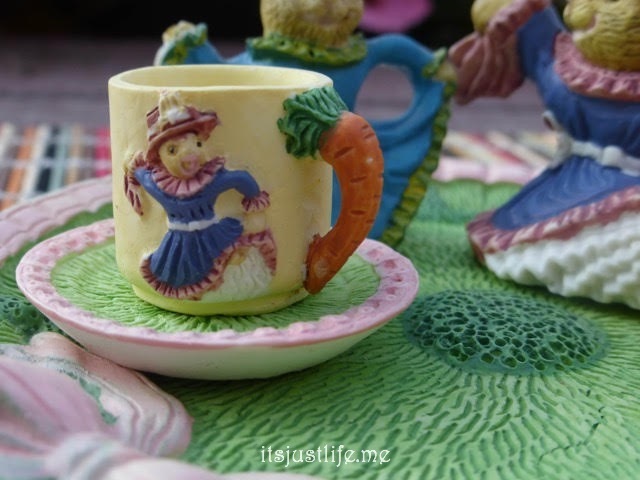 And this bunny tea set is no dust bunny! It’s darling and oh so happy! That is exactly how it happens. Exactly. I had a red kitchen one time and I also had that black and white cow theme going on so I can see how that happens. Thanks for stopping by, Katybeth, and sharing your fun story! This set is adorable and should join the other bunnies in your mom´s collection. I recently visited a salt and pepper shaker museum, which is the collection of one woman! I thought of you as it was so interesting and fun. Just the sort of thing you would love. I loved the pictures you posted. I have a friend who collects salt and peppers but nothing like this. Amazing! Who knew there were so many ??? Now I have “ice, ice baby” going through my head. 🙂 Yes, it is a great beverage iced as well! This is such a sweet tea set. Love the carrot handle. And I love, too, that you hide these for your mom. Sounds like my niece, who every time she visits my mom, leaves an “I love you, Grandma” note hidden somewhere. She’s done this since she was young and is now in her 30s. This means a lot to Mom as I’m sure your hidden bunnies mean to your mom. I love it and it feels very Easterish to me!! Yes! 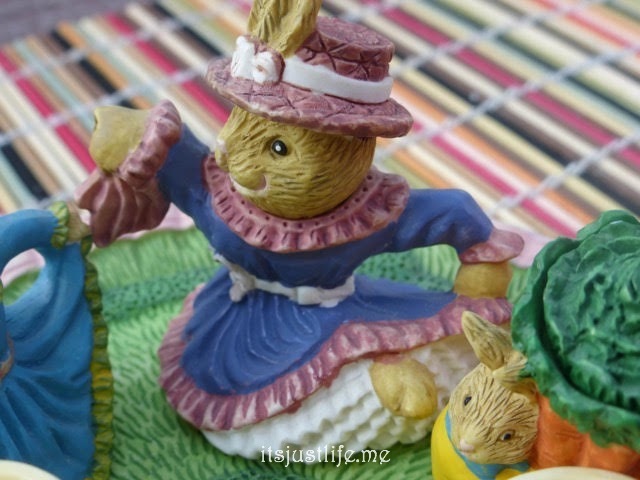 It is very Easterish!